GEORGE TOWN (Sept 10): Berjaya Auto Bhd's net profit dipped 6.94% to RM52.2 million or 4.58 sen per share against a marginally higher revenue of RM512.5 million in its first quarter ended July 31, 2015 (1QFY16) as a result of higher spending on advertising and promotion expenses. In a filing with Bursa Malaysia today, Berjaya Auto recommended a first interim single-tier dividend of 2.25 sen to be payable on Oct 21, 2015 for the financial year ending April 30, 2016. The ex-date is on Oct 6 while the entitlement date is Oct 8. The group is primarily engaged in the distribution of Mazda vehicles in Malaysia and the Philippines; retailing of Mazda vehicles; and provision of after sales services for Mazda vehicles in Malaysia. Berjaya Auto acknowledged its performance might be affected by regulations and policies governing the importation of completely built-up (CBU) vehicles and completely knocked-down (CKD) parts into Malaysia, as well as foreign exchange fluctuations; changes in consumer preferences and spending trend; unfavourable economic social and political conditions in countries where it operates or obtains its supplies of vehicles; and global market and credit market volatility. 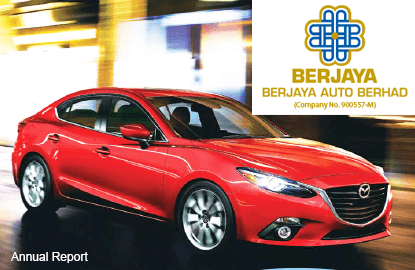 In a statement, Berjaya Auto said the implementation of the goods and services tax (GST) in Malaysia on April 1 had also impacted its revenue as sales is now recorded net of GST. The group pointed out that both its local and Philippines operations continued to record double-digit growth in sales volume of Mazda vehicles in 1QFY16. However, its revenue only grew marginally at 0.9% largely due to unfavourable sales mix relating to the competitively priced Mazda2 SKYACTIV and Mazda3 CKD SKYACTIV models. "(They) were the main contributor to the increase in sales volume in Malaysia. "Besides these two models, the group's sales volume growth was also driven by the CX-5 model which continued to do well in Malaysia and the Philippines," Berjaya Auto said. Looking ahead, the group said the remaining financial year 2016 was expected to be challenging due to local and global uncertainties caused by the weakening of the ringgit against the yen and other major currencies. It would have an effect on raising product cost and affect Mazda vehicles' price competitiveness in Malaysia amidst a soft demand in the motor vehicles market. "Many automotive distributors are offering huge discounts and special packages to reduce their inventory, and it will have an impact on our competitiveness and exert further pressure on our gross profit margin," it said. Berjaya Auto would focus more on market share growth by improvising its sales and promotion programmes, and work closely with its principal on product cost improvement that might mitigate some of the foreign exchange risk exposure. "New model launches which are anticipated to boost demand for Mazda motor vehicles have also been planned for the second half of this financial year. "With all these measures in place, the board expects to perform satisfactorily for the remaining quarters of the financial year," it said. Berjaya Auto dropped 12 sen or 5.33% to close at RM2.13 for a market capitalisation of RM2.56 billion.